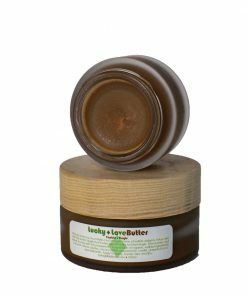 Living libations Lucky Love Butter is sure to entangle hips and lips with its chocolate flavors to savor and sensations to quaver. 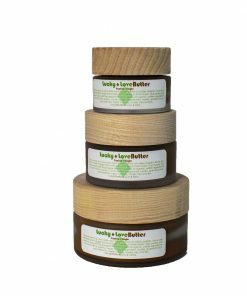 Stay up all night till dawn, greet the sun, and have fun with the intermingling mint of Lucky Love Butter, our tingling tantric take on a cacao-peppermint love-quake..
Our Lucky Love Butter is a mint-crème daydream of edible delights inspiring a fragrant garden of ways to stay up and play. 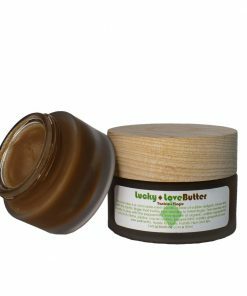 May be used as a moisturizing massage crème, non-latex lubricant, or as a love-lube to prepare lovers’ skin for the closest kind of encounter. For use every day or for long languid times of play. Patch test inside the elbow before applying to more sensitive skin. Theobroma cacao (Cacao) Butter, Cocos nucifera (Coconut) Crème, Simmondsia chinensis (Jojoba), Mentha peperita (Peppermint), Vanilla planifolia (Vanilla), Citrus paradisi (Grapefruit), and Sabal serrulata (Saw Palmetto). Cacao (Theobroma cacao) Butter – Pure cacao ignites the senses with amorous inclinations. 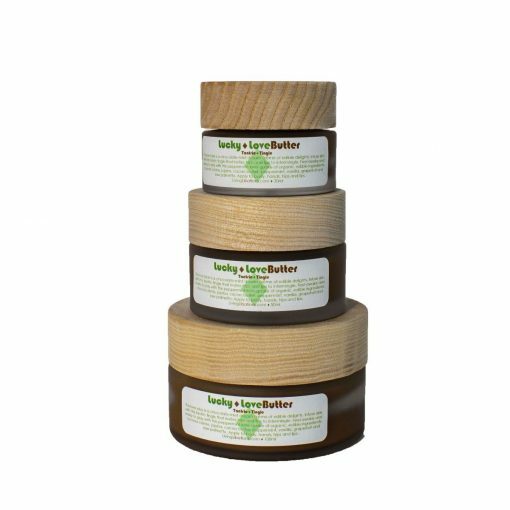 Made with certified raw heirloom cacao beans, our cacao butter delivers endless antioxidants deep into the skin. 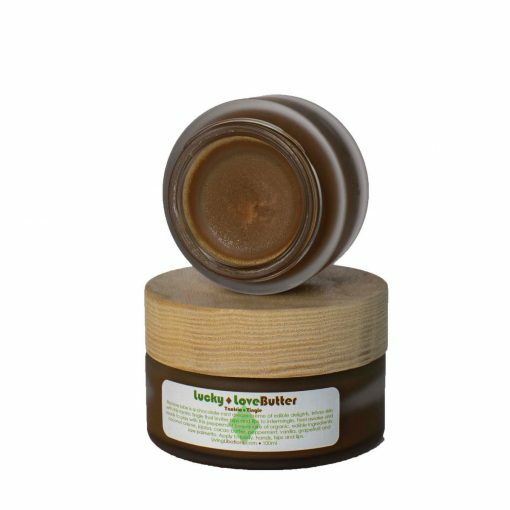 Thanks to the rich, velvety smoothness of pure cacao, this butter nourishes the skin as it enhances every tantric tingle. Coconut (Cocos nucifera) Crème – Delicious, delectable coconut crème seeps into the skin at a mere 75 degrees, allowing all of its wonderful nutrients to be completely absorbed by the body. Sweet coconut crème makes the skin lovely and supple, inviting embraces of desire. Jojoba (Simmondsia chinensis) Oil – There is no other compound in nature so similar to our body’s own oils as jojoba. 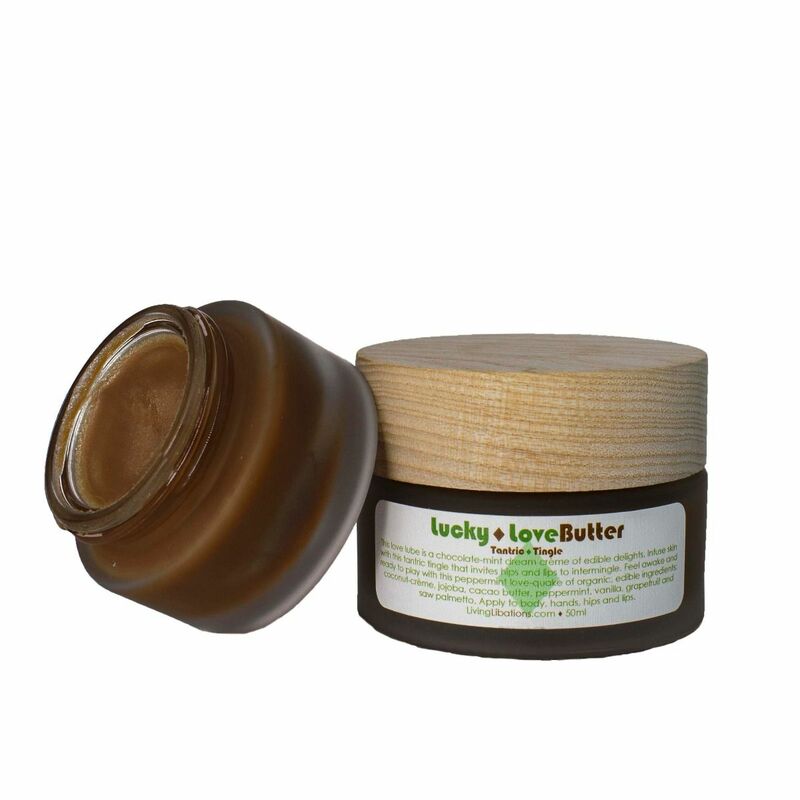 This potent moisturizing agent delivers moisture to the skin without clogging pores. Peppermint (Mentha peperita) Essential Oil – Effervescence every sense with the cool tingle of pure, peppermint. The clarifying compounds contained in peppermint will invite loving looks and tender touches as the skin rejoices with mint wonderment. Vanilla (Vanilla planifolia) Essential Oil – Aphrodite herself could not have concocted a more inviting aromatic if she tried. Sweet, arousing, mouth-watering vanilla diffuses tension, making way for amorous yearnings. Grapefruit (Citrus paradisi) Essential Oil – Gleeful grapefruit creates a beautiful, clarified canvas on which lovers can trace fingertip-stories across smooth, balanced skin. Grapefruit elevates emotions and tones skin. Saw Palmetto (Sabal serrulata) Essential Oil – Saw Palmetto Berry is expressed by supercritical extraction creating a remarkably rich and high quality oil. It is also an elixir for the skin, and contains many of the same benefits and loving lipids as seabuckthorn oil. Like seabuckthorn, Saw Palmetto Essential Oil keeps the skin’s moisture stable and pleasantly plump..